Go Global! Launching an International Career Here or Abroad is the go-to resource that reveals how you can tackle this exciting yet daunting challenge! Learn how to develop the necessary skills to identify and land a job in a world that has become increasingly interconnected and globally driven in the past decade. Employers are looking for special skills in today’s workers and you must know how to package your global brand to get a job. Go Global! is based on research, interviews with hundreds of successful internationalists, and Stacie’s years of experience living and working internationally. Go Global! 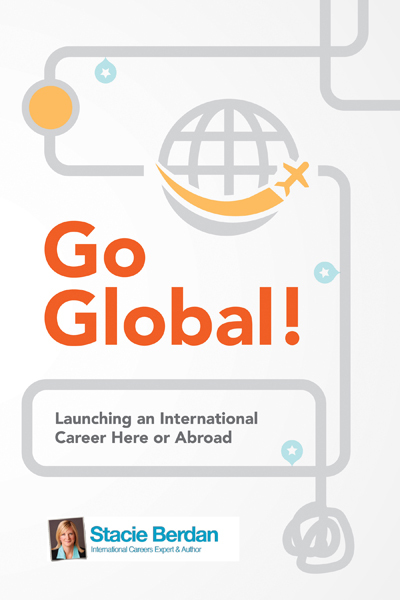 is the go-to guide that provides practical advice to help you think globally in an increasingly competitive global workplace; build relevant international cred; develop a killer job search strategy; create a winning global resume, cover letter, and elevator pitch; and launch your fast-tracking international career. Stacie discusses “Go Global!” on NYC PIX Channel 11.